UNIST and KAB signed a Memorandum of Understanding, creating partnership to establish an integrated anti-corruption framework and related integrity policies. 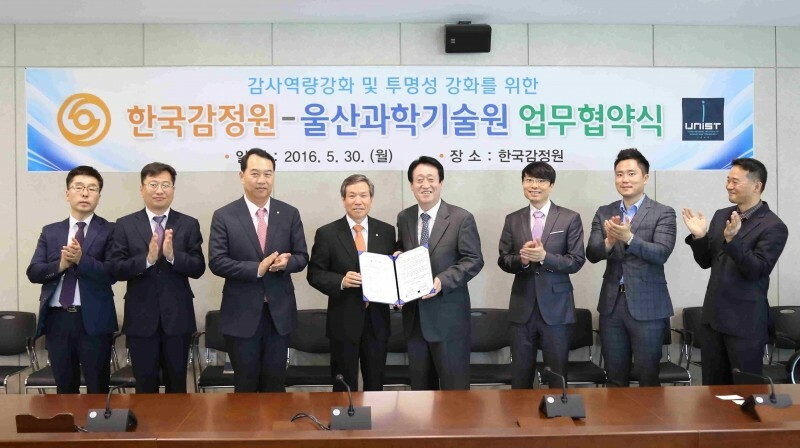 On May 30th, 2016, UNIST and Korea Appraisal Board (KAB) signed a Memorandum of Understanding (MoU) to pledge mutual support for one another in the establishment of an integrated anti-corruption framework and related integrity policies to build and sustain workplace integrity. In the memorandum of understanding, the two institutes agreed to foster networking and exchange of strategy and best practices on anti-corruption and integrity. At the meeting, Auditor Sung Euk Lee of UNIST and Inspection Commissioner HanSu Kim of KAB discussed on how to implement and enforce robust and effective anti-corruption policies and programs and how to deal with incidents of corruption if they arise. In 2015, UNIST received the highest score in the Anti-corruption Initiative Assessment, organized by the Ministry of Science, ICT and Future Planning (MSIP). Moreover, KAB has earned a Presidential Citation for receiving the highest rating in the Anti-corruption Initiative Assessment, arranged by Anti-Corruption & Civil Rights Commission.